The number of seniors who are 85 and older is growing rapidly. Life speaks to a group of them about outliving their peers and, in some cases, their children. Putting her feet up was far from Madam Tan Jin Hua's mind when she stopped work four years ago - at age 82. After the Japanese Occupation put a stop to school, she became a teenage midwife. She later trained as a nurse and worked up the ranks to become a senior matron in the primary healthcare services. When she retired at 55, a charity organisation invited her to be a matron at a home for the aged. She ended up running three care homes in Henderson, Bedok and Chai Chee - their names have since changed - from 1986 to 2011. Since she stopped working at the homes, Madam Tan has scheduled activities almost every day. She takes classes in cooking and conversational Mandarin, plays the erhu and ukulele, and "jams" with other ukulele-strumming seniors. "I really enjoyed working. But when I retired, I was able to do the things I wanted to do. Now, I'm free to try everything, to see what other people are doing," she says. At 86, Madam Tan is part of a group that gerontologists term the "oldest old". 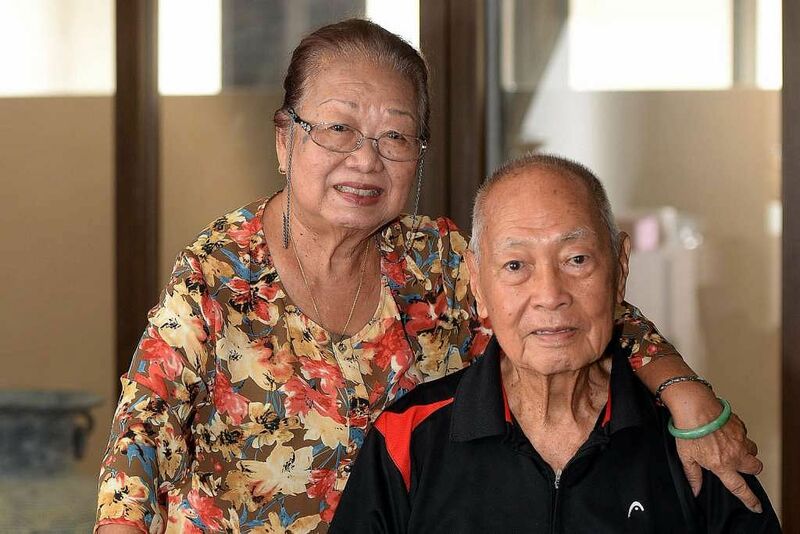 Aged 85 and older, their numbers in Singapore have risen. There are currently more than 41,000 persons aged 85 years and older here, up from 14,000 in 2005. Between the end of 2000 and June this year, the number of centena- rians here increased more than five times - from 232 to 1,200 - according to figures from the Department of Statistics reported earlier this week. Within that time frame, residents aged 90 years and older also spiked, from 5,431 to 14,200. "I JUST LIVE DAY BY DAY"
For Madam Tan, like some others in this age range, the autumnal years have brought with them independence in various forms. She enjoys mahjong and playing games of Rummikub, a tile-based game with elements of rummy and mahjong. Recently, she approached Silver Spring, a social enterprise that helps older people find employment, to check out the possibility of being a companion for the elderly. She also does qigong and attends an aqua-aerobics class. 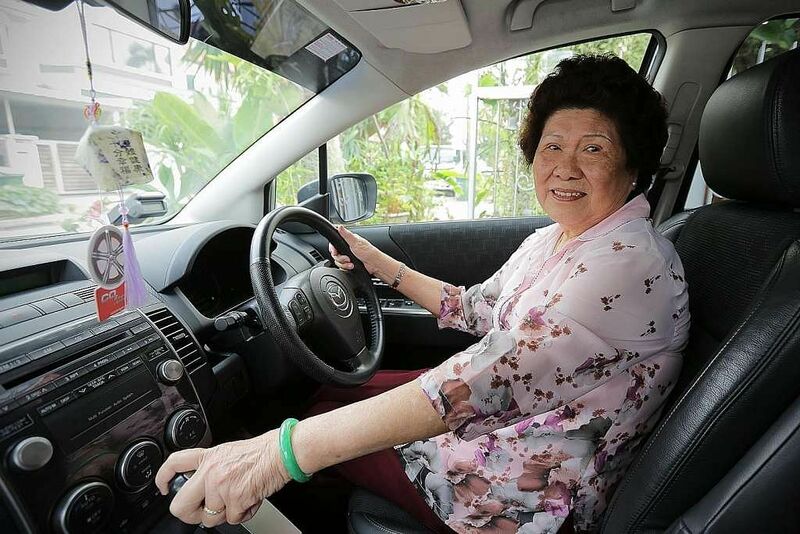 "If I want to go anywhere, I can drive there," says Madam Tan, who has 10 grandchildren and two great-grandchildren. She drives a Mazda 5 that she bought a few years ago. The seven- seater car is also used by her son and his family, with whom she lives in a terrace house in Sennett Estate, which her mother bequeathed to her and her two siblings, who have since died. Her freedom to pursue diverse interests comes after decades of toiling to support five children on her own. Married at 23, she was widowed 10 years later when her husband died suddenly of a heart attack at 39. She was pregnant with her fifth child then and her nurse's salary was $300. One of her four sons died from asthma in 2010, aged 52. She is stoic about life's hardships and prefers to live in the present. "I never think of the past. What for? I look at my great-grandsons and I'm happy," she says. Age is a state of mind for Madam Tan, who is interested in clothes and has luxuriant raven-black hair. "I colour it, you know." "I don't feel old except when I have aches and pains," she says. She has no serious health problems, but takes pills to control her high blood pressure and cholesterol levels. She has a matter-of-fact attitude towards death. "I'm prepared to go any time. I just live day by day," she says. Her Christian faith is a source of strength for her and she feels "very blessed" to be the age she is. She has written her own obituary notice and wants her ashes to be scattered at sea. To make it easier for her children, she has made plans for her funeral when the end comes. "I WISH TO WALK TO MY GRAVE"
Former primary school teacher Mary Chan, 85, says she "never imagined" she would reach this age. She and her husband, retired engineer Chan Wing Cheong, 89, lead active lives and travel long distances at least once a year to visit family. Three of their four sons live in Los Angeles and New York in the United States, and Brisbane in Australia. The couple live with their 51- year-old youngest son, his wife and their two children in a semi-detached house in the Mountbatten area. In the past few years, the elderly couple have visited Japan, Cambodia and Malaysia for leisure. Mrs Chan says next year may be the last time they travel to the US as the long haul flight is tiring. The loss of friends makes her feel "lonely". She says: "Some of them are gone or bedridden. We used to meet for lunch once a month. It started with a few tables, then one table and now no tables." She makes new friends at the gym among the younger people, some in their 40s. She works out for an hour each time, three times a week, alternating between gym equipment and aerobics. She and her husband believe that exercise is key to having mobility and a good quality of life. At 83, Mr Chan started working out at a gym three times a week, after he felt pain in his hip. He says the pain has vanished after he started regular sessions with a personal trainer. He goes on walks along the East Coast beach three times a week. "I don't want to be in a wheelchair. I wish I can walk to my grave," he adds. Madam Lily Hendrick, who turns 93 next month, has 18 grandchildren and 11 great-grandchildren. She lives in a three-room Housing Board flat in Whampoa with a maid. She says her nine children, who range in age from 50 to 70, do not need to give her money every month, "but they don't visit me empty-handed". They buy her food and household items, and also take her out. Some of them drop by at least once a week and the extended family gathers at events such as birthdays. While she has plenty of family support, financial independence is a concern. She says: "Money is important even in old age. If they give me, I keep it. But my children are getting old and I don't need so much." She has savings from the estate of one of her children, who died in 2009 of stomach cancer at the age of 49. "When the children come, I feel happier. I still worry about them. They say, 'don't worry about us', but how can I not worry?" she says. She had a privileged childhood as her father was "a rich man". When she was a child, she remembers him asking her to polish diamond earrings at his jewellery shop. But the family's fortunes changed. Her father died when she was nine, and her mum when she was 13. Taken into the care of her uncle, Madam Hendrick, the eldest of five children, had to leave school to care for her siblings. She married in her late teens and became a housewife. Five of her 14 children have died. Her husband, a jewellery maker, died at 70, more than 30 years ago. Old age is a calm interlude for her, though she has had to deal with weakness and infirmity. Three years ago, her osteoarthritis prompted the need for a wheelchair for long distances. She uses a walking stick at home. 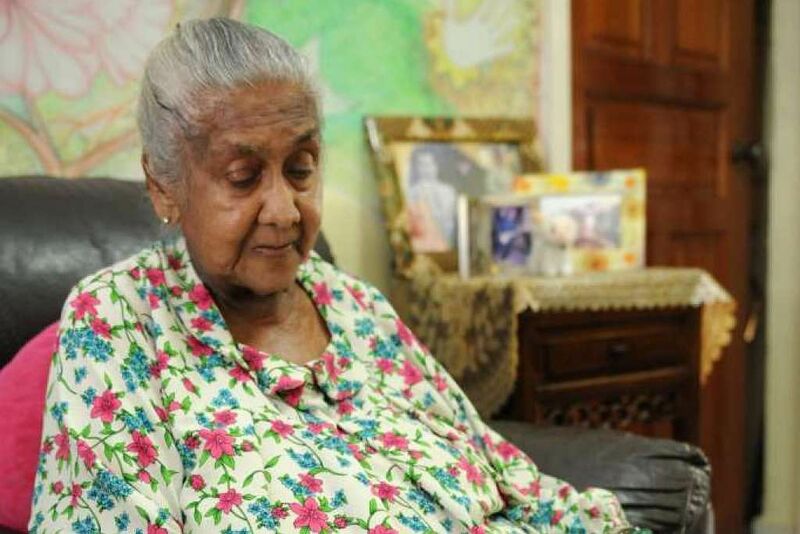 She often watches TV and goes to the neighbourhood coffee shop to eat with her maid, who occasionally wheels her, a Sinhalese Buddhist, to a temple 15 minutes away. "I'm mostly sleepy now. Sometimes it feels like my head is cloudy, but the doctor says there's nothing wrong," she says. "I feel like living. I want no suffering when I die." If her legs get stronger, she says she would like to renew her passport and travel. "I WANT TO KEEP FIT"
Health and mobility are fiercely cherished by senior citizens such as Mr Loh Min Thong, 91. 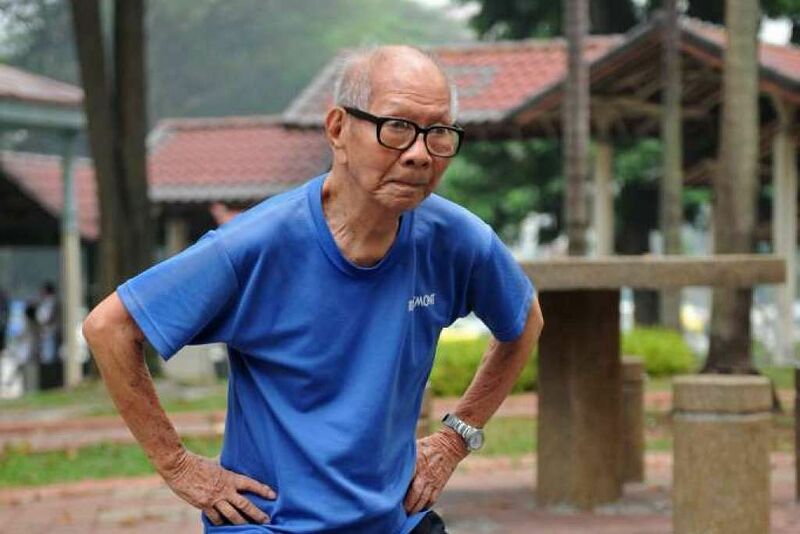 Mr Loh, a resident of the AWWA Senior Community Home since 1993, wakes at 5am daily to take a 45-minute walk in his Ang Mo Kio neighbourhood. He takes part in group exercises and dance sessions three times a week there. He also watches his diet, eschewing a former favourite dish, the calorie-filled pigs' trotters. He lives in a room with two other people and prepares simple meals such as pork ribs and radish soup and rice, or century egg porridge. Some meals at the home are free as they are donated by corporations. "I want to keep fit. It feels good when I don't feel lumps of fat when I sit down. You must take care of yourself. I don't want to depend on people," Mr Loh says in Hakka. He says he is slower with age and lacks the strength to unscrew the cap of a mineral water bottle. But he is trim with few wrinkles and a slight rosiness in his cheeks, beaming as he recalls people telling him that he looks 20 years younger. He reads the newspapers, watches the news and sometimes plays Bingo and dominoes with residents in the home. A son of his former boss sometimes visits and takes him out for a meal at the coffee shop. After years of financial strain, Mr Loh finds that he is no longer anxious about earning enough. The immigrant from Meiyan in China came here as a 23-year- old in 1947 to work for his uncle. The two bachelors made shoes and lived in a rented flat. Earning between $70 and $100 a month, he says he did not get married because "to have a family, you need at least $200". He says he does not have many friends as he speaks only Hakka. He has picked up some Mandarin and a smattering of dialects at the home. After his uncle died, Mr Loh continued his trade. He sought help from the Government for a place to live as he had to leave the last home he rented when the area was redeveloped more than 20 years ago. "I have enough money, I don't gamble, smoke or drink. I don't worry about having a place to sleep and food to eat," says Mr Loh, who gets an allowance of $250 a month from AWWA. "I feel proud that I'm still alive at 91. Other people are no longer around at 70."